Along with Attorney General Bob Ferguson, Gov. 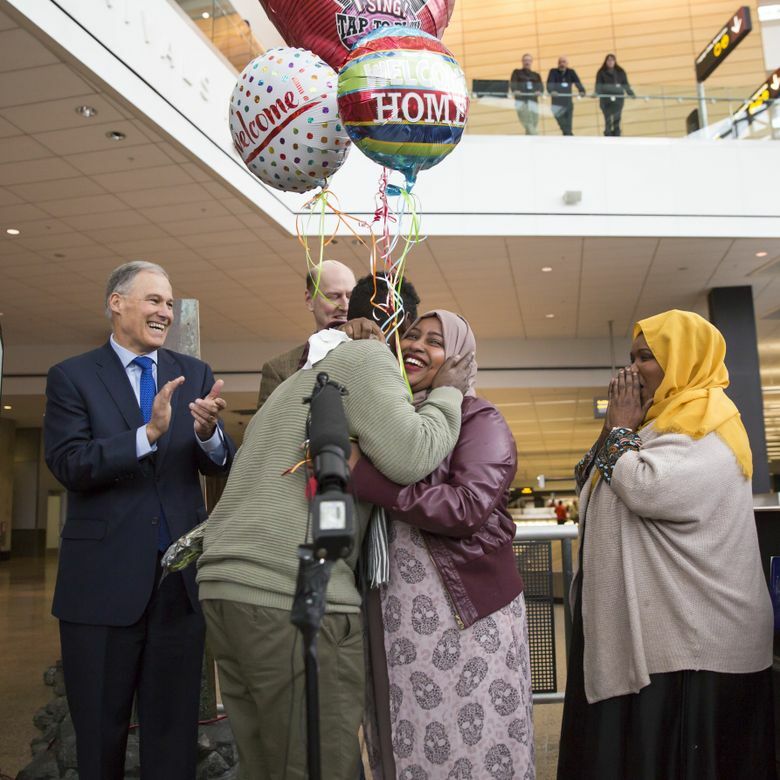 Jay Inslee has enjoyed multiple victory laps after the state’s legal wins in a lawsuit to block Trump’s executive order halting travel from seven mostly Muslim nations that have been identified as terrorist potential threats. The turbulent early weeks of President Donald Trump’s White House have had an unexpected side effect: boosting Washington Gov. Jay Inslee’s national profile. Since the start of February, Inslee has been interviewed, sometimes repeatedly, by CNN, Fox News, MSNBC, the BBC, NPR, The New York Times, The Washington Post, The Wall Street Journal, POLITICO and Bloomberg TV, among others. Along with state Attorney General Bob Ferguson, Inslee has enjoyed multiple victory laps after Washington’s legal wins in a lawsuit blocking Trump’s executive order halting travel from seven mostly Muslim nations that have been identified as potential terrorist threats. Among Democrats searching for new leaders after taking their own thumping in November, Inslee’s loud pushback against Trump has resonated. And though it’s exhaustingly early — we apologize for even talking about this — to think about the 2020 presidential race, some already are suggesting Inslee could be in the mix. In an interview Friday, Inslee downplayed any presidential ambitions. “I love this job. It’s really not in the stars. I am focused on this,” he said. His advocacy for refugees is not a new development, Inslee noted, pointing to a November 2015 Op-Ed piece for The New York Times in which he criticized politicians who wanted to close the door to Syrians fleeing that nation’s bloody civil war. “I’ve been working on this for a long time — before anybody thought Donald Trump would be president,” he said. Nevertheless, Inslee’s elevated profile has grabbed attention. Presidential historian Douglas Brinkley, a professor at Rice University, said he has thought for a while Inslee could prove “the ideal Democratic nominee” in 2020. While the Pacific Northwest has never produced a president, Brinkley said Washington could have a good story to tell about a booming high-tech center and global trade — as well as advancing ideas from legalization of marijuana to gay rights and raising the minimum wage. But Margaret O’Mara, a history professor at the University of Washington, said the state generally has not rewarded those harboring national political ambitions. The last prominent presidential candidate from Washington state was the late U.S. Sen. Henry M. “Scoop” Jackson, who contended for the Democratic nomination in 1976 but lost to former Georgia Gov. Jimmy Carter. A former congressman from Bainbridge Island, Inslee, 66, was easily re-elected to a second term in November. He has plenty on his plate in Olympia. The state remains in contempt of court over failing to adequately fund public schools, with a divided Legislature that has shown few signs of coming to agreement on a fix. In December, Inslee proposed more than $4 billion in higher taxes over the next two years, including a tax on capital gains, a carbon tax and the largest business-tax increase in decades. Those higher taxes would top $8 billion by the 2019-21 biennium. State Republican Party Chairman Susan Hutchison said at a late-January news conference she had “sources” who told her Inslee has an eye on the White House. In an interview last week, she cited Inslee’s budget proposal as further evidence, calling it the product of an “absentee” governor who “has never really left” Washington, D.C.
“He dropped off this crazy budget that has these gigantic tax increases and walked away,” Hutchison said, comparing him unfavorably to past governors including Gary Locke. Whatever his plans, Inslee has risen in leadership among Democratic governors, giving him further national reach. As finance chair and then vice chairman of the Democratic Governors Association, Inslee has jetted around the country, giving speeches and meeting with big political donors. Next year, he’ll chair the national group. According to his calendar, Inslee has had recent meetings or phone calls with prominent national Democratic figures, including AFL-CIO President Richard Trumka, as well as former Labor Secretary Tom Perez and Rep. Keith Ellison, D-Minn. — rival candidates to chair the Democratic National Committee. Some political advisers to Inslee said that while he has found his voice as a Trump foil, he is motivated by nothing more than the belief that the new administration is a threat to long-held American values. D.J. Wilson, a Lynnwood-based political consultant who publicly urged Inslee to run for president in 2016, said Inslee is focused on the Legislature and not electioneering. But she said there are other Democratic politicians who have seized the anti-Trump limelight too, including U.S. Sens. Elizabeth Warren, D-Mass. ; Kamala Harris, D-Calif.; and Cory Booker, D-N.J.
“Anyone leading the resistance is going to be a household name,” Tanden said. Citing two sources close to the Trump administration, the New York Post reported last week that top Trump adviser Stephen Bannon had asked GOP consultants to start tracking some potential 2020 Democratic challengers. Atop that list were Ohio Sen. Sherrod Brown, Connecticut Sen. Chris Murphy, Colorado Gov. John Hickenlooper and Dallas Mavericks owner Mark Cuban.